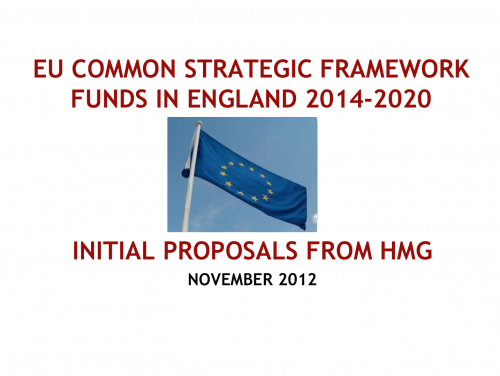 On the 17th of December 2012, Network for Europe attended a consultation event on European Structural Funding 2014-20 which was held in Preston, where senior representatives from CLG, DWP, DEFRAi and BIS set out emerging Government thinking on the new programme. This was an important event – one of a series that will inform a formal public consultation in 2013 on the proposed approach the UK Government will take for the ‘Partnership Agreement’ – the high-level business plan that the UK will agree with the European Commission, which will establish the template for delivery of the funding programmes. The event was well attended from stakeholders in EUi funding programmes across the North West including some Voluntary and Community Sector organisations. BIS intend to hold a further consultation on the proposals in the spring of this year and NFE will be (along with help from the EU Ref Group) co-ordinating a NW VCSi response to that. In the meantime if you would like to make any comment to BIS directly about the new programmes please do so at structuralfundsnegotiations@bis.gsi.gov.uk . Please copy info@networkforeurope.eu in on any comment, if you don't mind.